This corded necklace is made using waxed cording. The length can vary from about 16 to 19 inches with a center jeweled piece that adds 3.25 inches. It is done in pink and white. The jeweled piece starts with a beautiful dusty rose glass disc surrounded by fully-faceted glass coins. 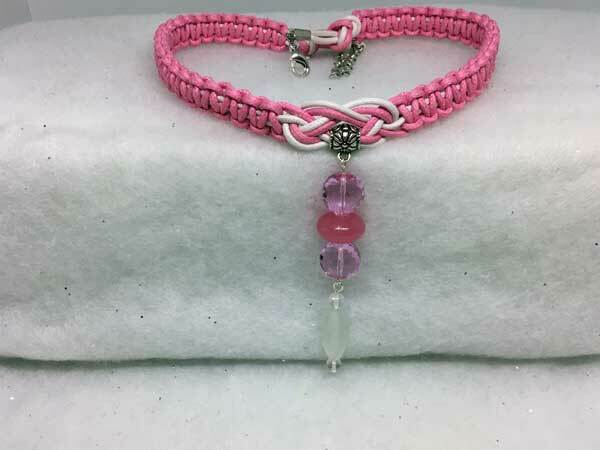 The coin beads look more bluish in the photo, but they are a softer pink that coordinates nicely with the cord. Hanging separately from that are a large frosted rock quartz surrounded by 2 clear rock quartz rounds. The cost of the gems here would normally dictate a higher price, but I got a great deal on some stones and am paying it forward!